Or maybe June is the month with feathers, to misquote the Belle of Amherst. I was wondering this morning what I would choose, because even though I have a list, I also win when I stay open to serendipity. And then I was mobbed with birds. In a good way. I saw a lovely bi-colored tree swallow coming out of the bakery, and an enormous woodpecker flew across the road in front of the car, and a host of tiny twinkling things flew along beside me through a field in Hadley. So it seemed like birds would be a good subject for the month. 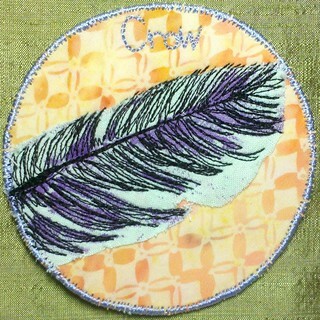 This is a stitched print of a crow feather Alice found for me Thursday night. Another sign!